MIDDLEBURY - Fred Barnes wasn't surprised when 18 freight cars carrying tons of gasoline and rock salt derailed in downtown Middlebury on October 22. He says he saw it coming. Barnes lives within 100 feet of the track near where the derailment occurred and has been a critic of its condition ever since he moved to Middlebury 12 years ago. The derailment has spurred him and about 200 other residents to petition state and local governments to make repairs immediately. Barnes, 69, is a retired brick layer and a jazz pianist who has found a new purpose as the train-safety representative of the Woodbridge Condominiums and neighboring Pinewood Apartments, two residential developments a half mile from the center of Middlebury. "Here we have two or three hundred people who could be potential victims, right on the tracks, right next to the tracks," warns Barnes. "It could possibly be a catastrophic event." Thankfully, the Middlebury incident, which occurred on tracks leased to Vermont Railway, was not. Only one of the 14 cars carrying 26,000 tons of gasoline sprang a leak. A small fire followed the initial derailment, but it was extinguished quickly. Parts of the town were evacuated, but the accident scene was cleaned up, and downtown Middlebury was re-opened 16 hours after the accident with no injuries reported. 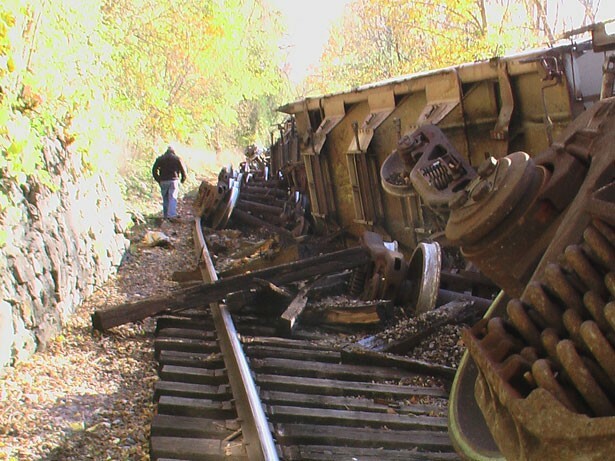 State and federal officials concluded that the derailment was caused by a broken rail forged in 1923, when steel was processed differently than it is today. But Barnes thinks a general lack of maintenance is to blame. Walking along the tracks 12 years ago, he noticed bent rails, missing railroad ties and loose spikes. Nine years later, he walked on the tracks again and saw no improvement. Steven Kulm, the director of public affairs for the Federal Rail Administration, notes that tracks may look bad to the untrained eye but still meet federal regulations. The FRA oversees the condition of all tracks in the country, but relies on individual rail operators to perform regular inspections and maintain infrastructure safety. David Wulfson is president of Vermont Railway, the operator of the line through Middlebury. He states that the "tracks are safe in Middlebury, and everywhere else that we operate. And we spend a lot of time to keep them that way." In fact, he adds that Vermont Railway goes above and beyond the federal maintenance and inspection requirements by performing expensive yearly ultrasound tests on the tracks. The FRA does routine spot checks to make sure that the operators are complying with federal regulations, and also performs more focused inspections when specific problems need to be addressed. After the Middlebury accident, an FRA inspector went to the scene to investigate. "As part of our investigation, we look at the equipment, we look at the track, we talk to the train crew members. The accident is over, the scene is cleared up, the tracks are repaired, the train operations resume," Kulm says. Wulfson adds, "After the derailment, we had every government agency there is inspect the tracks, and no one found any maintenance issues." John Tenny, the chairman of the Middlebury Selectboard, says the post-accident repairs included "considerable work done to renew and reinforce the rail bed and to improve drainage conditions along that rail bed." Tenny is aware that citizens are petitioning for further repairs, but says that the town is not concerned about the safety of the tracks at the moment, and is "quite pleased with the response of the railroad" after the derailment. That satisfaction is what worries Barnes. Middlebury was satisfied before the recent derailment, too, he points out. And it appears the state knew the tracks needed to be repaired even before the accident, but disagrees with Barnes that they are not safe for trains. Vermont Agency of Transportation spokesman John Zicconi says that major track renovations for the Middlebury area are scheduled for the spring and fall of 2008. The renovations were planned prior to the derailment. The agency intends to completely replace track, ties and ballast from the center of Middlebury to 3 miles south of town; from the center of town to 8 miles north, the track and ties will be replaced as needed. The first phase has a budget of $1.5 million and is scheduled to start in the spring. The second has a budget of $1 million and will begin in the fall. "It's pretty much set, ready to go, and the money's there," Zicconi promises. "We understand that the folks who live there have concerns," Zicconi continues. "I hope they will understand that major construction is not something we do in the middle of winter in Vermont. We're confident that the track is safe at this time." Barnes isn't buying it. "I ask anyone - state, federal or town - to walk the tracks with me and look me in the eye and tell me they're safe," he says.